PHILADELPHIA, Penn. – McKenzie Milton accounted for five touchdowns, Shaquem Griffin played the role of an apache attack helicopter and Orlando’s Home Team was unfazed by the cold northern weather in a 45-19 rout of the Temple Owls. It is the first 10-0 start in school history, an insane transition from winless to double-digit wins in less than two seasons. Coach Frost does not touch any talk of games that aren’t the next one on the schedule. To hear that he addressed the team means that he was genuinely concerned about a “trap” game, concerned about losing focus at the finish line. “I was a little worried about this game, being the game before the game, being in the cold, being our ninth straight week playing a football game – a lot of factors kind of pointed to this one potentially being a tough one,” said Frost. Milton lobbed four touchdowns on the day – to Gabe Davis, Otis Anderson, Tre’Quan Smith and Marlon Williams. He completed 16 of 23 passes for 208 yards and no interceptions before leaving the game late in the third quarter to allow Vedral’s mop-up duty entrance. 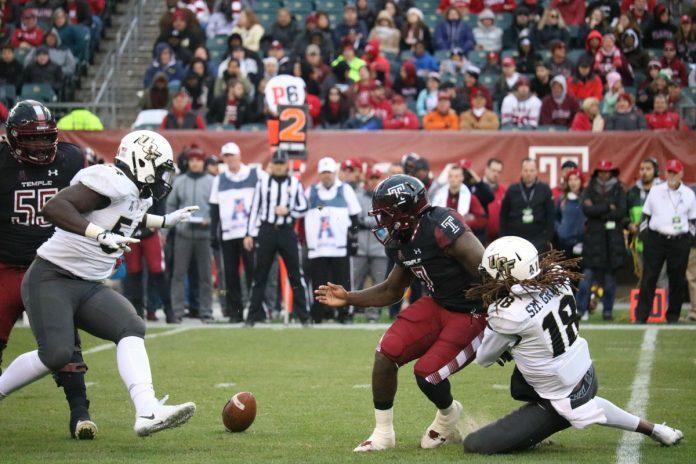 Five turnovers from the defense and a fourth down stop kept UCF’s field awfully short. The Knights capitalized from each one, running up the score early with stolen possessions. By halftime UCF had run away with a 31-1 lead. The short field kept the usual video-game numbers relatively low for the UCFast offense, subduing the production of an offense generating 500+ yards of production to just 384 on the day. It was in no way indicative of the unit’s prowess, just a matter of situational football. Shaquem Griffin was the catalyst for the situational rarity, mimicking his twin brother’s athletic skills as a defensive back to haul in the basket-catch interception, and wreaking havoc in the backfield all game. He finished the day with three tackles, a tackle for a loss, an interception, and a forced fumble, but his presence was felt heavily in the backfield. Temple Quarterback Frank Nutile completed just 17 of 40 passes under duress while gifting the Knights four interceptions. UCF refused to let the cold bother them, as certain players ran out for warm ups without shirts on to adjust. Frost said the power move wasn’t an organizational mandate, but that the guys decided to do it on their own. Tre’Quan Smith had a slightly different story, saying that the staff had asked them to go out without any sleeves on, but the team took it to another level. The Florida boys were more than ready to play. They stayed perfect, and are ready for their next battle – a full-scale war with USF. Tre’Quan is confident that even on short rest, the Knights are hungry for the rivalry.